Our grapes have been placed and carried in buckets and boxes to the presses to proceed the pressing by the first fermentation. They currently are in a state of very young wine. The Champagne-harvest of 2017 is through, and let’s just say that our expectations are as big as we dare. Even we have picked the grapes, sorted them out and when tasting them appreciated their interesting balance between high acidity and a strong sweetness, we still cannot know them very well as wine. Neither young, nor older and since every change has many possible directions, we'll have to wait to know what flavours and tastes time will bring us. In 2017, the growth of the vines began already in early April, and we were lucky to avoid damages when it froze a few weeks later. Very warm days, very little rain were the standard most days until mid July where the temperatures finally dropped and days got cooler. We were quite happy to see the super speed of growth slow considerably down. Even a bit of rain made the grapes gain some weight. Later more rain followed with a timing we liked a lot less since lots of rain closely before the grapeharvest is a likely source of possible disease. 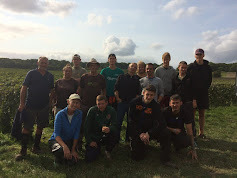 The start of the grapeharvest was agreed as late as a week before we began on September 2nd. For us, it was too late to save it all as a surprisingly fast deterioration left us with many rots between our Pinot Meunier-grapes. Consequently, we had to leave grapes on the ground instead of in the bucket. We count ourselves lucky because our Chardonnay-grapes came out a lot better. 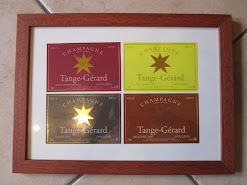 These are the grapes, we are currently working into one of our Tange-Gerard plot champagnes. Grapes that came very close to a perfect degree of sugar, and a must that contained a delicious creaminess that we are looking much forward to check and taste again when the young wine will be stable in a few months. 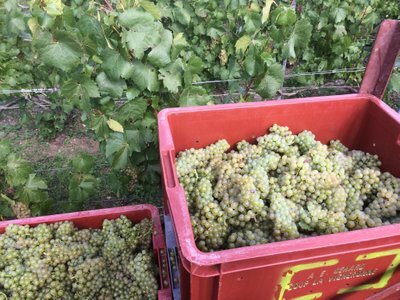 This 2017 vintage will be the first Tange-Gerard champagne from an early year. It is also the first time that we have measures of our grapes being challenged by the plants that grow naturally between the rows since we do not remove them constantly. When the vines have to compete with wild plants about access to minerals and water, this may show for instance in the natural level of nitrogen in the berries. 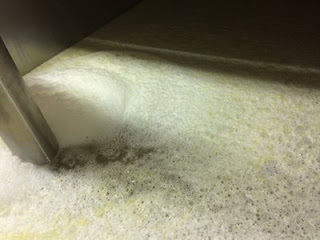 As nitrogen is needed in the early stage of the fermentation, we had to add some to help the work of the yeast. So exciting to trace our sustainable methods directly at this crucial moment. Double exciting it shall be to taste the result in some years. This far, we concentrate on our vintage from 2013. This was the first grapeharvest where we managed to make our first champagne with 100 % our own plots' grapes. We remember the year as unusually late. The grapeharvest continued in October which nowadays is very rare in Champagne. October 3rd, we pressed the grapes of this 2013-vintage, that will be the first of our new ”Singles” line of champagnes with a very limited amount of bottles and the symbol of sustainable viticulture on its label. Stay tuned for more news later this autumn. Our assortment this far continues with the ”Classic” line including the assembled champagnes of Tradition and Noirs & Blancs, the vintages The Blanc de Blancs (vintage 2011/12) and Selection (vintage 2007) and rosé champagnes Rosé d'Assemblage and Rosé de Saignée .